LEAP’s Sixth Annual NeoRio art event is part of the nationwide celebration of the 50th anniversary of the Wilderness Act and is the culminating event in Questa’s “Thinking Wilderness” series. 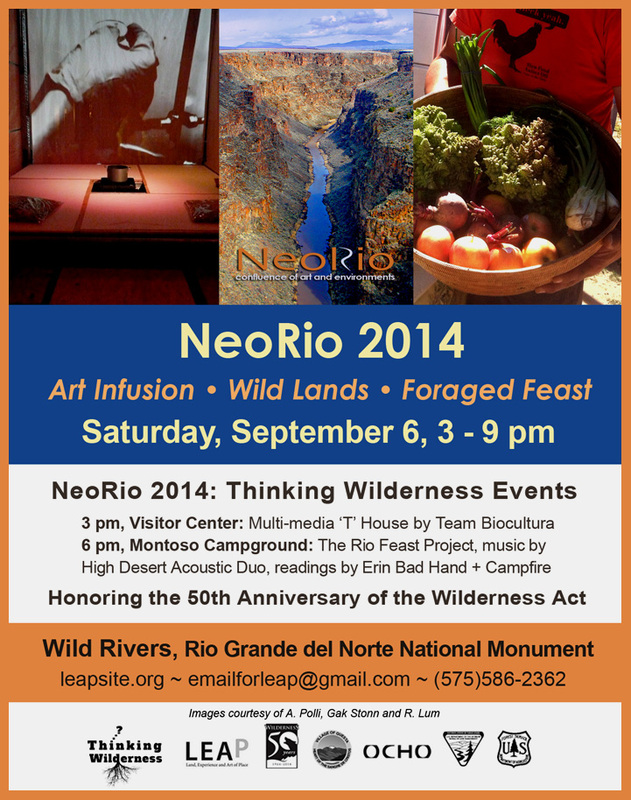 NeoRio – confluence of art and environments, is set to take place on Saturday, September 6, at Wild Rivers in the Rio Grande del Norte National Monument, accessed on County Road 378, just north of Questa. Starting at 3 pm at Wild Rivers Visitor Center, take in a dynamic artist lecture and experience the ‘T’ House’ by NeoRio featured artists, Andrea Polli and John Donalds (Team Biocultura). Inspired by a traditional teahouse, the ‘T’ House project explores relationships between humans and wild plants gathered from the protected lands in and around Questa. Team Biocultura invites you to their multi-media ‘T’ House to make and sample your own “wild tea” in cups and tea bowls crafted by Questa’s local clay artists including Kathy Morsell and Sandra Harrington. “We couldn’t have dreamed that researching tea would take us to the Netherlands, the Midwestern US and now back to New Mexico for NeoRio. Every strand of research seems to lead us to a more complex thread of connections between our own bodies, tea and the world around us,” observes Andrea Polli, Team Biocultura collaborator. Internationally known for her work at the intersection of art, science and technology, Polli is an Associate Professor in Art & Ecology with a joint appointment between Fine Arts and Engineering. She also holds the Mesa Del Sol Endowed Chair of Digital Media at The University of New Mexico. Her partner, Donalds’ work combines media and architectural practice by designing fantastical spaces that mix futuristic materials and forms with traditional, buildable structures. He has collaborated on projects such as “Eden Again,” a human wastewater garden planned for Iraq’s first National Park. In the evening, enjoy a community feast by artist and cook and environmental executive, Ric Lum. Created with food foraged from wild places and farms in our local Rio Grande area, the meal is part of Lum’s multi-year undertaking, The Rio Feast Project. The project consists of a series of meals situated along the Rio Grande from its source in Southern Colorado all the way through New Mexico, Texas, and Mexico, to its outlet in the Gulf of Mexico. “These meals are symbols of the connections and associations that form when people make a commitment to “walking the land” and becoming intimately acquainted with regional foodways,” says Lum. The evening will also feature a campfire, music by Justin Dean and mark Dudrow of High Desert Acoustic Duo and readings by local poet, Erin Bad Hand, all inspired by this year’s theme, Thinking Wilderness. The evening events will take place at Wild Rivers in Montoso Campground at 6 pm. This year NeoRio also celebrates the launch of LEAP’s online “Wilderness Thinkers in Residence” project on September 3rd, the actual day of the 50th anniversary of the Wilderness Act. The project will feature a new “Wilderness Thinker” every week from Sept. 2014 – Sept. 2015, showcasing diverse ideas in varied mediums from local to national and even international participants. The project continues to accept Wilderness Thinker submissions at: http://www.thinkingwilderness.org. NeoRio 2014 is a BLM Public Lands Day event at Wild Rivers with support from the Questa Economic Development Fund, Questa Mine Community Fund, OCHO Art & Event Space , Forest Service Questa Ranger District, Village of Questa and other organizations, individuals and local businesses. “Many people in Taos County know and use the lands in the new National Monument, but the NeoRio projects this year provide unique and innovative ways to connect to a landscape that we already love,” says John Bailey, BLM spokesman for the Rio Grande del Norte National Monument. For more information, visit http://www.leapsite.org/neorio or call Claire at 575-586-2362. This entry was posted in Announcements and tagged Team Biocultura, Wild Rivers, Wilderness Act on August 30, 2014 by Thinking Wilderness. Enter your email address to receive weekly notifications of Featured Wilderness Thinkers in your inbox.